You save money by having several types of inspections performed during the same trip. See our Radon Information page on what is included. Because of the many requests, we now offer this inspection by itself. Most Radon Mitigation System installations: As of January 2019 we no longer offer this service. Systems generally cost $800.00 and up depending on the house and how the system needs to be installed. We recommend that you use an qualified Radon Mitigation professional who knows how to properly design and install systems. You can visit the AARST-NRPP web site to find a certified professional or the KDHE website in Kansas to locate licesned professionals. We are still licensed - both nationally and in the state of Kansas but will not be installing sysstems as of January 2019. For all other services including duplex, quadplex, or light commercial inspections, give us a call and we will give you a quote. * Prices above are for transactions paid by Check, Money Order, or Cash. If paying with a Credit or Debit Card we use PayPal. PayPal charges for their services and the amounts below reflect their charges. If you are comparing prices, make sure you compare apples to apples. We don't have additional charges for a crawl space, if a house is more than 25 years old, if the home is a bank repossession, or for square footage as long as it is under 3500 square feet. You won't be surprised on inspection day with additional costs. Make sure your inspector is insured and listed on their certification organization's web site. Check us out on our ABOUT US page. Our whole house single family dwelling inspection is a non-intrusive visual inspection of the house STRUCTURE inside and outside, ROOF, FOUNDATION, and a MECHANICAL INSPECTION which includes the HEATING, AIR CONDITIONING, PLUMBING, ELECTRICAL, and all BUILT IN APPLIANCES. This is a visual inspection by our inspector that follows industry standard methods and procedures. We inspect areas that are visibly accessible without damaging the house. This inspection does not include: Outbuildings, sheds, detached garages, swimming pools, hot tubs, appliances not built in (not permanently attached), walk in refrigeration room equipment, security systems, alarms, or luxury items such as; intercoms, camera systems, built in home theaters, weather stations. See our FAQ tab for more information. A signed contract and payment is required before the inspection can be completed. Note: PayPal charges to use their services. The extra amount over $330.00 covers what PayPal normally charges. This package inspection includes the Whole House Inspection listed above and a Wood Destroying Insects Inspection (W.D.I. or Termite Inspection). Our Termite Inspections are not offered by themselves because we need to inspect the home inside and out and it would not be a cost effective inspection by itself. We only inspect with a State Certified and Licensed W.D.I. (wood destroying insects) Inspector. The W.D.I. inspection will check for infestations, signs of prior damage, and make recommendations for W.D.I. treatments if applicable per state requirements. Note: PayPal charges to use their services. The extra amount over $380.00 covers what PayPal normally charges. This package inspection includes the Whole House Inspection listed above and the 48 hour Real Estate Radon Inspection (described below). By ordering these together you save. Since Radon tests take a minimum of 48 hours, the test results will not be available until after the test is completed. See information on our Radon Tests for what is required and more information. A signed contract,consent to test agreement, and payment is required before this test can be performed. Note: PayPal charges to use their services. The extra amount over $430.00 covers what PayPal normally charges. This package inspection includes the Whole House and Wood Destroying Insects Inspections (both listed above) and the 48 hour Real Estate Radon Inspection (described below). By ordering all three inspections at the same time you save even more. The RADON INSPECTION is a test for the presence of Radon gas or its radioactive decay products in the home. The test is to determine whether your home has concentrations of Radon in excess of 4pCi/L (4 pico curies per Liter of air), the EPA's action level recommending radon reduction. Integrity Building Inspections offers Radon testing by a Certified Inspector and monitor in accordance with National Radon Prevention Program (NRPP) and Environmental Protection Agency (EPA) protocols. Our inspectors are NRPP trained and use only NRPP approved and calibrated devices following EPA testing protocols for Radon monitoring. See our RADON INFORMATION section for more useful information on Radon. The Radon inspection requires a signed Consent to Test Agreement that informs all parties the requirements that must be maintained before and during a 48 hour Radon Test for Real Estate Contract purposes. The results are downloaded from our continuous monitors immediately after the testing period. Nothing needs to be shipped off to a lab requiring additional delays waiting for the results. Our inspector has been certified in reading the results of your test. See our Radon Information section for additional information. A signed contract, consent to test agreement, and payment is required before this inspection can be completed. Note: PayPal charges to use their services. The extra amount over $490.00 covers what PayPal normally charges. This is the Radon Test only by itself (a popular option for homeowners concerned about their family's exposure). The RADON INSPECTION is a test for the presence of Radon gas or its radioactive decay products in the home. This test is the Real Estate test per EPA's protocols EPA 402-R092-003 and EPA 402-R-92-004. The test is a 48 hour snapshot of the radon in your home to determine whether your home has concentrations of Radon in excess of 4pCi/L (4 pico curies per Liter of air), the EPA's action level recommending radon reduction. Integrity Building Inspections offers Radon testing by a Certified Inspector and monitors in accordance with National Radon Prevention Program (NRPP) and Environmental Protection Agency (EPA) protocols. Our inspectors are NRPP trained and use only NRPP approved and calibrated devices following EPA testing protocols for Radon monitoring. This test requires a signed Consent to Test Agreement that informs all parties the requirements that must be maintained before and during a 48 hour Radon Test for Real Estate Contract purposes. The results are downloaded from our continuous monitors immediately after the testing period. Nothing needs to be shipped off to a lab requiring additional delays waiting for the results. Our inspector has been certified in reading the results of your test. See our Radon Information section for additional information. Note: PayPal charges to use their services. The extra amount over $160.00 covers what PayPal normally charges. Cost to inspect an already inspected house. $180.00. The extra amount paid with PayPal is to cover their charges. If you already paid for the Whole House Inspection for $300 but wish to add a W.D.I. or termite inspection at the same time you can pay for it here. This upgrades the Whole House Inspection to a Whole House with W.D.I. or Termite Inspection. ﻿﻿﻿﻿ Note: PayPal charges to use their services. The extra amount over $ 50.00 covers what PayPal normally charges. We work with many homeowners that just want to know what to fix on their home before it goes on the market but don't want to pay for a complete inspection. We offer Partial Home Inspections covering only specific areas of the home and verbal inspections. A verbal inspection is a normal home inspection but without a written report. You are required to accompany us on the inspection and take all notes. We will take pictures of issues per our Standards of Practice but there will be no formal written report. You, the client will be taking all notes and are responsible for recording issues. Since there is no formal report we can offer this service at a considerable discount. The Amount listed below is for a verbal inspection (no written report). Note: PayPal charges to use their services the cost to pay on line is $250.00 plus about 3% that PayPal charges. We will now offer a W.D.I. inspection by itself. This is a thorough visible inspection of the home for wood destroying insects using the NPMA-33 form required by most lending institutions and government agencies. Note: PayPal charges to use their services. The extra amount over $ 140.00 includes what PayPal normally charges. Costs for inspecting a home foundation only - no other areas. We often inspect just the foundation for homeowner refinancing their home (sometimes required by the bank). This inspection is considered a Partial Home Inspection and will only cover the exterior grading, foundation, supporting beams and columns/posts. This Partial Inspection costs $250.00 (Cash or Check). Note: PayPal charges to use their services. The extra amount over $250.00 is what PayPal normally charges. Where do we provide Home Inspection and radon services? We provide services all over the Greater Kansas City area and surrounding suburbs. Normally we try to limit our travel to 30 miles without additional costs for mileage. We will travel further with mileage reimbursement. 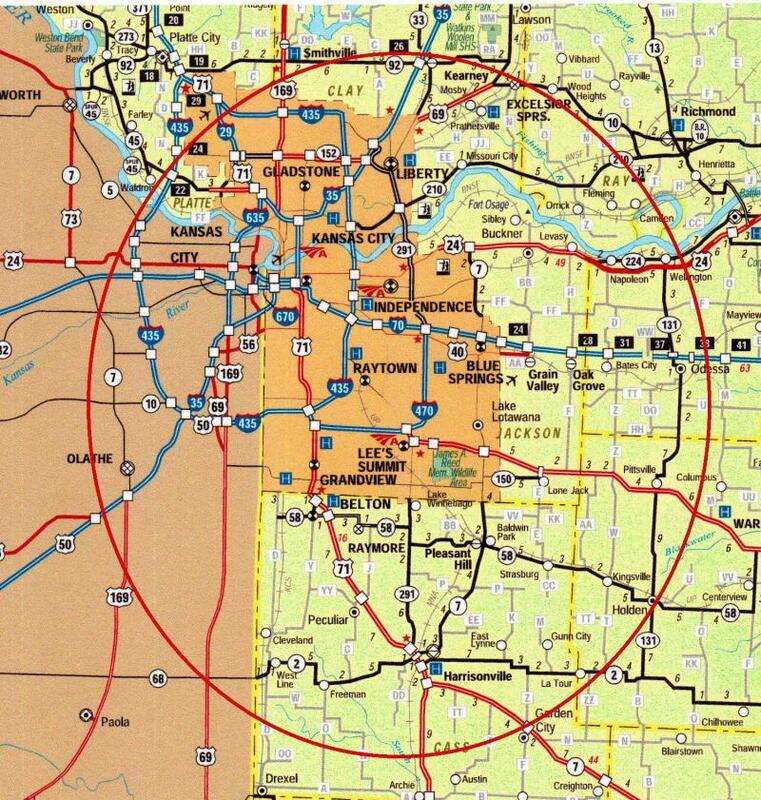 Our business is located on the Lee’s Summit / Kansas City border (center of the circle of the map). We try to schedule inspections in the same area of the city on the same day to minimize travel time and fuel costs. If we are already in the area, we might be able to go further out than 30 miles without additional fees. Call or e-mail us and we can let you know if there are any additional fees for inspections in the county outside our normal 30 mile service area. Please call us for a quote when you know the specific town outside our normal area.